Rickshaw fare regulation has caused some users to shift their mode of transport from private vehicles to auto-rickshaws in Chennai, though further reforms are necessary to address drivers’ concerns. Photo by Morgan Schmorgan/Flickr. 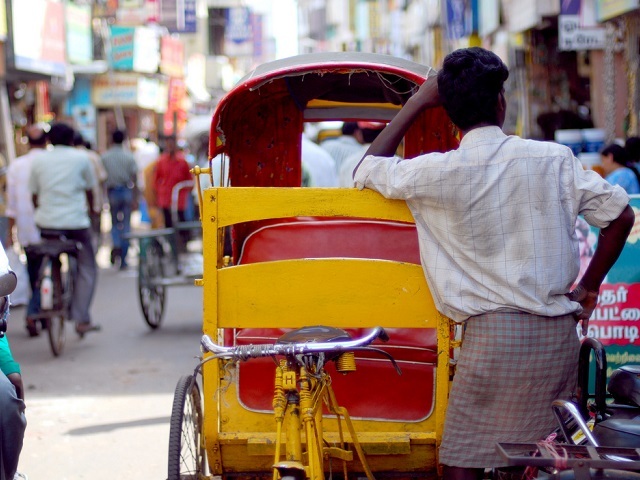 Chennai, India has long been notorious for its lawless auto-rickshaw drivers. On August 25, 2013, the Tamil Nadu state government sought to change this perception by reforming rickshaw fare structures for the first time in 17 years. The government was forced to implement the reform based on a directive from the Supreme Court following a petition filed in 2010. Tamil Nadu’s transport commissioner hosted a closed door meeting with stakeholders to gather input for the rerforms and with EMBARQ India’s assistance, the state devised a meter-based fare system acceptable to all. However, it remains unclear whether this restructuring will have a significant impact on either the users or the drivers’ perception of the system, or whether the restructuring will shift users away from private cars to the more sustainable transport option. To uncover whether or not fare restructuring had an impact on user behavior, EMBARQ India spent three months speaking to over 500 commuters and 500 auto-rickshaw drivers in the city, along with stakeholders such as government officials, auto-rickshaw union leaders, entrepreneurs, activists and journalists, to discover how the fare restructuring has impacted customers and drivers – and identify what challenges still remain. EMBARQ India’s surveys, conducted between February and April 2014, revealed that the price reforms prompted many commuters to shift their dominant mode of transport. At the beginning of the survey, 89% of respondents reported that they use their personal vehicles due to the poor quality of auto-rickshaw and public transport services in Chennai. Nearly 80% of respondents, however, reported having shifted some trips from other modes of transport to auto-rickshaws after the reforms. The survey has also shown that pricing reform has influenced residents’ decisions to buy cars. Almost 79% of the respondents owned personal vehicles, of which 73% were not planning to buy another motor vehicle after the auto-rickshaw meter reform. From the respondents who did not own any vehicle, 63% are not planning to buy any personal vehicle. Both of these shifts in mindset speak to the positive influence of fare reform on perceptions and usage of Chennai’s auto-rickshaw fleet, providing residents a viable and sustainable mobility option beyond the car. By contrast, roughly 87% of auto-rickshaw drivers were not satisfied with the meter reform, and have been hesitant to accept it. This is largely due to the fact that while the daily average distance travelled by drivers has marginally increased from 97 km (about 60 miles) per day to 98 km (about 61 miles) per day and the daily average number of trips has also marginally increased from 21 to 22 per day, “dead trips” – where no one is in the vehicle – have also increased by about 4% on average. In short, drivers are driving more but losing revenue. In addition, when auto-rickshaw drivers are earning money, they aren’t earning as much – drivers report a drop in earnings of 24% from 720 INR (USD 12) before reform to 547 INR (USD 9) after the fare reform. It must be noted, however, that this reduction in income could not be confirmed because fare price before the reform was largely based on the bargaining acumen of the rider. Because of the drivers’ resistance, the state government has established a grievance call center for customers to register complaints regarding drivers’ non-compliance with the new meter policy. Transport authorities intend to take strict action against the accused drivers, but putting the burden on the customer to enforce a state-wide policy is not an ideal solution for any party involved. For potential customers, the main factor preventing them from using auto-rickshaws during heavy traffic periods is over-charging by auto-rickshaw drivers. According to the survey, 48% of commuters found that drivers are still negotiating for a higher fare or are asking for extra money over the meter reading. Although it is true that drivers are burning more fuel and travelling shorter lengths for the same fare, a middle ground between strict regulation and pure negotiation is the route that would satisfy both drivers and passengers. Additionally, 16% of customers believe that the metered fares are still not competitive to other cities and other modes of transport in the city. About 25% of commuters blame the culture of the drivers, including rudeness or harassment, as a reason not to use auto-rickshaws, while 5% cite safety concerns. Drivers’ concerns relate more to overregulation in a competitive market. About 21% of the auto drivers feel that competing share-autos and share-taxis have cut into their ridership and revenue. In such a competitive market, they feel it is necessary to have the freedom to barter. About 4% of auto drivers are frustrated by the need to bribe the Regional Transport Office for permits, license and fitness certificates and feel victimized by the new regulated fare. Others say that they cannot use the meter system because the reported 24% reduction in earnings does not give them enough income to live on. Another 7% cite the fluctuation of fuel prices, and a fare that does not rise with it, as a challenge. Finally, 37% of the drivers reported an increase in dead trips as a challenge. This resistance to the fare reform will likely continue without necessary adjustments. To increase the number of commuters using sustainable transport like rickshaws, Chennai must establish a mutual consensus between all stakeholders. To help further reform the system, EMBARQ India plans to expand these statistics with more robust recommendations to help the city, drivers, and commuters resolve these challenges. To learn more about the impact of auto-rickshaw fare reforms in Chennai, see EMBARQ India’s survey results here. For further questions regarding EMBARQ India’s survey, please write to Roshan Toshniwal at rtoshniwal@embarqindia.org.